Take a Stand Against Oral Cancer with Your Dentist in Virginia Beach! April has been designated as National Oral Cancer Awareness Month. Thus, your dentist in Virginia Beach reminds you of the importance of being proactive in your efforts to prevent this disease. 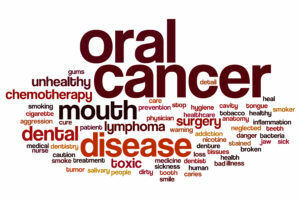 But if you’ve never heard of oral cancer, you’ll learn more about it as you continue reading. Your local dentist will also clue you in on what symptoms of the disease to be on the lookout for and the importance of semi-annual visits for screenings. Oral cancer refers to the abnormal growth of mutated cells in your mouth and throat. If not treated, this disease can be fatal. Mouth – When in your mouth, oral cancer can affect the lips, cheek lining, gums, front of the tongue and roof of the mouth. Throat – If the disease enters the throat area, it can be found in the tonsils and base of the tongue. Every year roughly 10,000 people succumb to this disease, but with early detection, the chances of fighting it are much better. Recent studies have found a link between gum disease and oral cancer. The former develops when there is excess bacteria growth in the mouth, leading to the gums being infected and inflamed. Researchers have found that aside from the detrimental effects of gum disease, the bacteria can also contribute to the growth of mutated cancer cells. This points to the importance of practicing excellent oral hygiene, which includes – at a minimum – brushing and flossing twice a day. Your Dentist Joins You in the Fight! One of the best ways to protect yourself from oral cancer is to maintain semi-annual visits to your dentist for cleanings and examinations. One of the great values of the checkup is that your dentist will perform an oral cancer screening as part of it. Therefore, you’ll leave her office with more than just clean teeth – you’ll be able to get a clean bill of health. If, by chance, some signs of oral cancer are detected, you and your local professional will be able to formulate a plan to address it. As alluded to earlier, through early detection your options for treatment will be greater than if you wait until the disease is full-blown. So let National Oral Cancer Awareness Month serve as a reminder to contact your dentist to schedule a preventive care visit today! A graduate of the University of Maryland Dental School, Dr. Sarah Esparza has nearly 20 years of experience practicing dentistry. A multi-faceted professional, she has served in the US Air Force and has practiced dentistry as far away as Japan. Dr. Esparza provides compassionate and expert care at Esparza Family Dentistry and can be reached for more information through her website. Comments Off on Take a Stand Against Oral Cancer with Your Dentist in Virginia Beach!